Malysia originally was part of the British Empire, with many of the Malay states being autonomous from each other, being headed by their own king. They where grouped together in a federation of Malay States from 1896 to 1950. 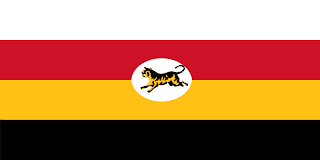 The flag that was in use was a horizontal quadcolour flag, using white, red, yellow, and black. The colours representing the 4 Malay states that make up the Federation. At the centre is a white disc, on which is a leaping Malayan tiger. In 1947, as Malaya moved towards Federation, there was a flag competition for a new flag to represent them. The winner was Mohammed Hamzah. His winning design took its inspiration from the US flag, and featured 11 red and white stripes representing the 11 states in the Federation. The blue represents the unity of the people, the crescent in the canton represents Islam, and the 11 point star represents the unity between the 11 states. The yellow on the star and crescent represents the historical significance of yellow as a royal colour in south Asia. This flag was in use from 1950, to 1963. The Federation of Malaya gained its independence from Britain in 1957, and then, in 1963, Sarawak, Sabah, and Singapore joined the Federation of Malaya to create Malaysia. Brunei was due to join, but then declined as the status of the Sultan was unclear, and there was a question over the payments of oil money. 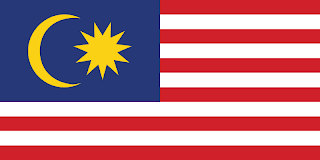 The new Malaysia added 3 stripes to the flag to stand for each of the new states, and 3 more points where added to the star. Taking the flag to 14 stripes, and 14 points on the star. However, Singapore subsequently withdrew only a few years later. 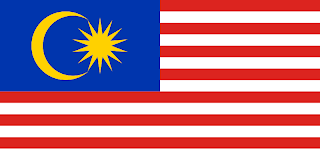 With the creation of Kuala Lumpur as federal territory, they felt that the 14th point and stripe should come to mean Kuala Lumpur, so there was no need to modify the flag. 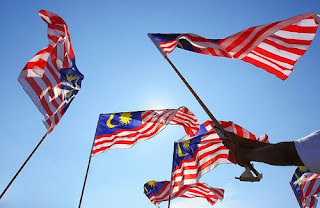 In 1997, the Malaysian government opened up a competition to pick a name for the flag, with Jalu Gemilang being selected.